AND Here at Suburban Furniture, we know that you have a choice of stores when shopping for furniture. We can’t tell you how much we appreciate your business. But we sure can show you and YEAR ROUND. For every dollar you spend at Suburban Furniture, we give you money back towards future purchases. That’s why the more you buy at Suburban, the more you save. Visit our showroom to pick up your very own Loyalty Card and start saving today! 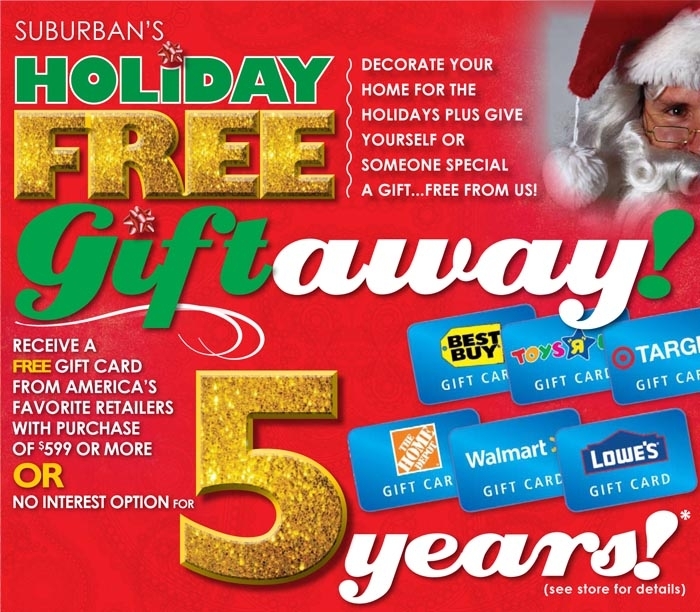 Posted on December 17, 2013, in Uncategorized and tagged furniture store holiday giveaways, holiday free giftaway suburban furniture, holidays and furniture, suburban furniture loyalty card, suburban furniture nj. Bookmark the permalink. Leave a comment.